Composity is a cloud-based enterprise resource planning (ERP) and customer relationship management (CRM) solution for small and medium-sized businesses across a range of industries. The platform combines several modules which allow users to automate core processes, manage operations, generate reports, and more. 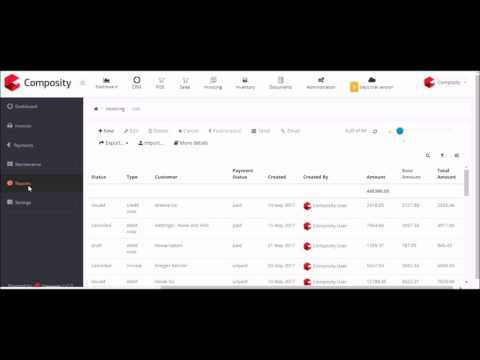 Composity’s CRM module allows users to manage relationships with potential and converted clients throughout the entirety of the sales process. Full client histories, detailed profiles, and custom account data enable the collection and recording of all relevant information, and multichannel communication capabilities cover chat, email, phone calls, web forms and support enquiries. The CRM also provides features for managing marketing campaigns, customer segmentation, events, projects and tasks, quotes, invoicing, and payments. Composity’s ERP system offers tools for managing inventory, manufacturing, purchasing, documents, finances, sales, invoicing, and more. The integrated point of sale (POS) software allows users to manage in-store processes such as sales, payments, and deliveries for single stores and chains, with online store integration. Composity also offers business intelligence and analytics, providing users with insight into their company’s performance. In my line of work all is about the customer. You have to establish personal contact, to know what every client want, what are his/her preference, if they have bought already something from you or are interesting in something specific. It's very difficult to track and know everything about my clients so I use Composity CRM to help me do that. It's very useful and easy to work with software. The CRM is integrated or can be integrated with other software solutions. I can manage all my business activities from one place. But most of all I like that If I have a problem or a question their support team is excellent in solving it. User- friendly and useful product with great customer service. Thanks for the feedback, we really appreciate it. Cheers! Basic: free - up to 3 users. Growth: $55/month - up to 10 users. Professional: $110/month - up to 25 users. Business: $220/month - up to 50 users. Contact Composity for details of Enterprise plans. • Custom fields allow sales reps to record personalized data for each account, and comments and notes can be added to profiles. • Leads can be graded manually by users or automatically based on predefined criteria and detailed rules. • Core business processes, including creating and sending invoices, communicating with customers, and reporting on orders, can be automated. • Communication from multiple channels, including emails, phone calls, forms, chat, and support enquiries are linked within the CRM. • Users can create an unlimited number of custom activity types, which can be accessed by all users and recorded in any account. Below are some frequently asked questions for Composity. Q. What type of pricing plans does Composity offer? Q. Who are the typical users of Composity? Q. What languages does Composity support? Q. Does Composity support mobile devices? Q. Does Composity offer an API? No, Composity does not have an API available. Q. What other apps does Composity integrate with? Q. What level of support does Composity offer?